Up Mommy Creek: Our 1st Giveaway: Free Movie Passes from Cineplex! Our 1st Giveaway: Free Movie Passes from Cineplex! Note: This Giveaway is now closed. Thanks!! This summer, one of the most anticipated movies (probably ever) is being released: Harry Potter and the Deathly Hallows Part 2. After seeing the first movie, I started reading the books, and like most other people, I loved them. Such a great blend of adventure and fantasy, all mixed with a little teenage angst. And the movies have been phenomenal so far. So it is with great anticipation that I look forward to seeing the last installment of the series, which comes out (coincidentally enough!) on July 15th; the same day Peanut is also supposed to come out! Cineplex Entertainment and Warner Bros. Pictures Canada have an awesome deal this summer. 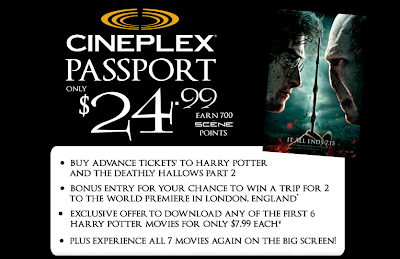 They are offering a Harry Potter passport, which means you get to see all 7 Harry Potter movies in the theatre on the big screen again. 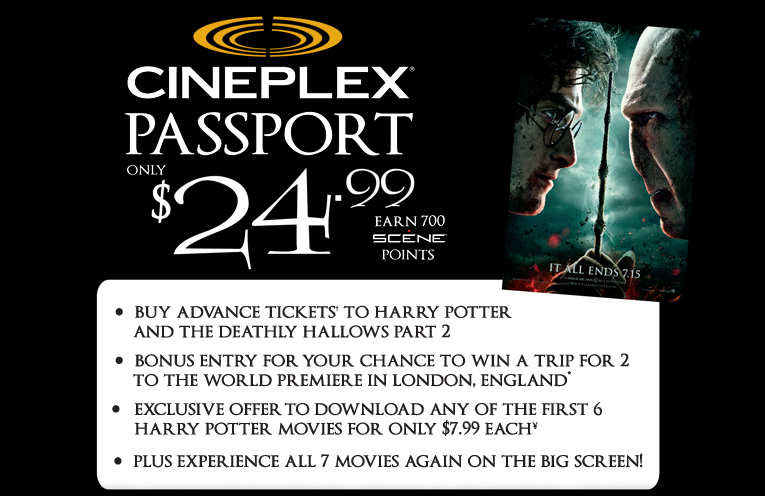 Plus, you get 700 Scene points, and priority ticketing for the Deathly Hallows Part 2. You also get a contest entry, and download deals. To check out the details, go to the Cineplex website. The passport only costs $24.99, which considering the price of movies these days, I think is a steal of a deal. The best part about the whole thing, in my opinion, is that they are showing one movie each week, so you pretty much have plans for you and your Hubby or your kiddos all summer. They run each weekend (Saturday mornings and Monday evenings) until the new movie comes out. So it’s also a good refresher for those of you who are like me, and have trouble remembering what the heck happened in the last movies. You can also grab tickets for the individual shows for only $5...I don't remember the last time I only paid $5 for a movie. If you share this post on your blog, Facebook, or Twitter, you will receive a bonus entry. Just post an additional comment with the link. At the end of the contest period, I will choose the contest winners using the random number generator at Random.org, and post the winners here. The passes are good for general admission for ANY movie of your choice at your local Canadian Cineplex theatres...sorry my international friends. Just to be clear, it is not the passport you will be winning, and you don't have to use the passes for Harry Potter, you can see whatever movie your little heart desires. And that’s it! Easy-peasy, no? The contest will close at 7pm MST on Friday, June 3, 2011. If you are a Harry Potter fanatic, or even if you just sorta like him, you can check out all things Harry here. I feel like I should end off with something wizardly, like a spell or something…goodicus luckioso??? My favorite one was "The Half-Blood Price. I loved that it was so much darker than the others. I don't know what that says about me. I have a feeling I'll love "The Deathly Hallows", but I have yet to see it. There are only two books that have made me ugly cry and "The Deathly Hallows" is one of them. (If you pick me as the winner, I'll tell you what the other book was.) Dumbledore Rules!!!! My favorite was the first one because that's where it all began. When I watch it now I can't believe how young everyone looks! While i do love ALL the Harry Potter movies, I would have to say that The Deathly Hallows Part 1 is my favorite (so far!!) They keep getting better and I liked that it was really dark and more geared for adults. I can't wait to go see part 2!!!!!!!!! Deathly Hallows Part 1 is my favourite by far. It had all the elements of a good movie without having read the books, which I feel some of the others were lacking. Hooray for part two! Haha I actually have not seen any of the Harry Potter movies, never really did anything for me! For shame I know. The first one, it started off the franchise and got me hooked. I don't know if I can pick one. I absolutely love the whole series. Everytime I tell Brian I want to watch a movie he knows I want to watch a Harry Potter movie. Hi Amy! I would have to say, that after the Harry Potter Marathon my brother set up for me, the last one (The Deathly Hallows Part I) is so far my favourite! PS. 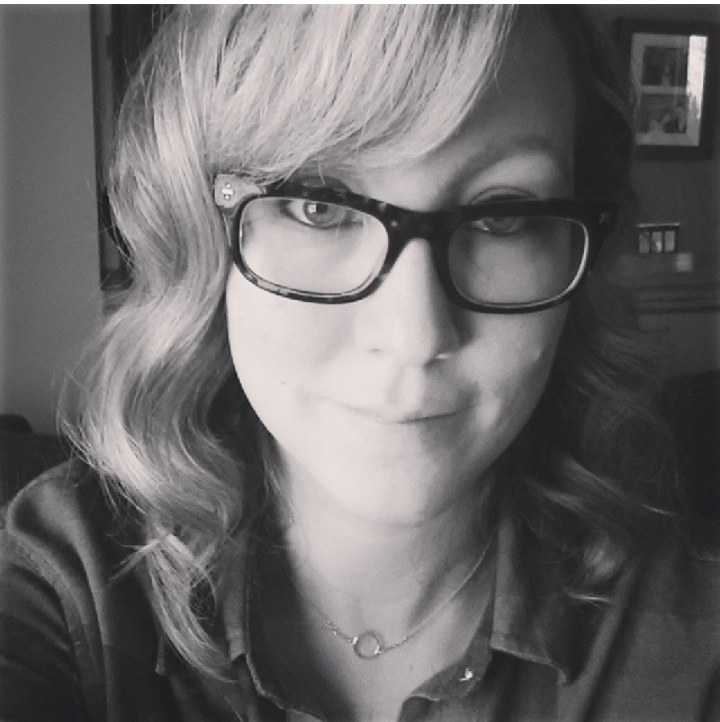 I posted about your giveaway on my last blog post! Congrats on your last day of work BTW! Enjoy!